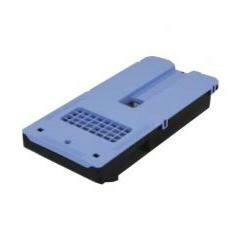 This is a new maintenance cartridge (also called the waste ink container) for the SCL-4000D and SCL-4000P label printer. If your printer is displaying the error message "Maintenance cartridge full" then you will need to replace it. Please note: This maintenance cartridge does not fit the SCL-8000P printer. #LIFE SPAN#The maintenance cartridge collects waste ink produced by the printer during printhead cleaning cycles which occur after print jobs. The frequency with which the maintenance cartridge must be replaced depends upon how often the printer is used and how often the operator runs additional printhead cleaning routines. Excessive cleaning will cause the maintenance cartridge to fill up more quickly. Once full the maintenance cartridge cannot be emptied, it must be removed and disposed of. The printer will not function once the maintenance cartridge is full so it is essential that a spare unit is kept in stock to avoid down time.